5400 series amplifiers are an integral part of the IED GLOBALCOM® EN54-16 Communications System. 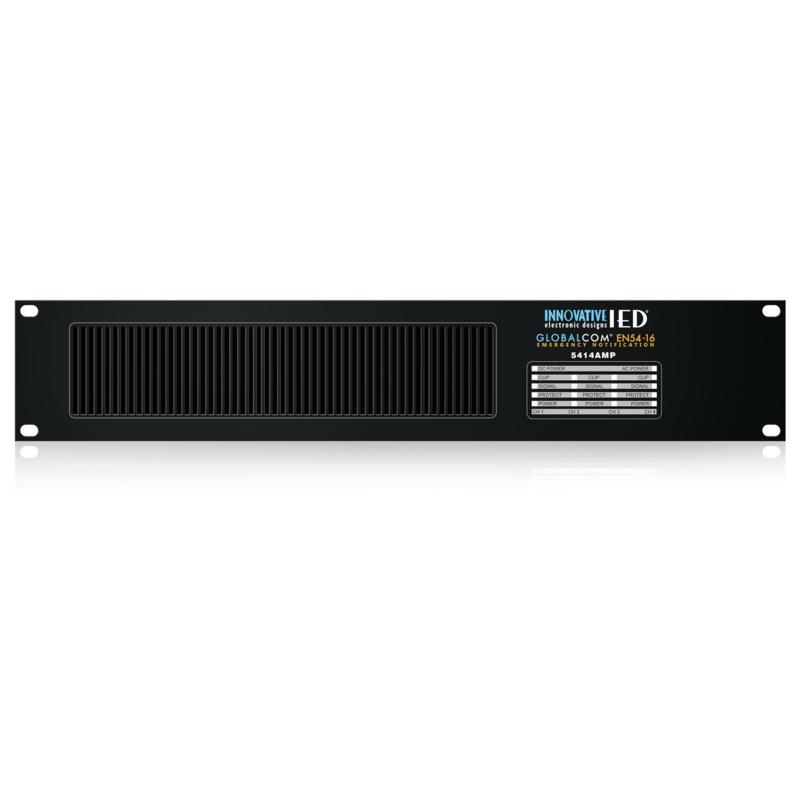 The IED5414AMP features four channels of 100 watt amplification. The amplifier is Class D switching mode which provides benefits such as: higher efficiency, increased reliability, improved performance, and lower operating cost. Switching mode operation combined with high voltage power devices make it possible to eliminate the heavy, costly, bulky transformers used by some amplifiers to drive 100V distributed speaker lines. The amplifier is internally monitored and limited to prevent over-current and over-temperature conditions, also protecting the amplifiers from harm due to short circuits on the speaker lines. The 100V floating direct outputs reduce more than just the weight: Installation and rack prices will drop significantly. The cost for energy consumption will average at roughly one third of any ordinary amplifier. In addition to mains power, a 24VDC power input is provided in the event of power loss which will automatically switch to 24V battery power - without any loss of output power. The amplifiers are typically paired with a 5404DZM or 5432DZM for EN54-16 compliant systems. The mainframe requires two (2) rack units (3.5") of vertical space in a 19" equipment rack/cabinet. All cooling is front to back.